Less bloodshed, more scares…that’s what make for a good horror movie these days. This post first ran in 2015. I, for one, am glad that in recent years, horror filmmakers have decided that scaring the crap out of people is more important than grossing them out by spilling buckets of blood. 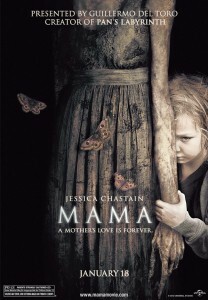 The 2013 gem titled Mama, starring Jessica Chastain, is a prime example of this. As a jaded viewer and reader of horror, I had a few peek-between-my-fingers moments while watching this film, which is not even rated R (it’s PG-13). Stockbroker Jeffrey D’Asange (Nikolaj Koster-Waldau, who also plays twin brother Lucas) loses a fortune in a financial meltdown. Distraught, he kills his business partners and his estranged wife then takes his daughters, three-year-old Victoria and one-year-old Lily, on a dangerous drive along a snowy mountain road. The car crashes, but they survive. They come across a dilapidated cabin, where Victoria believes that she sees someone—or something—inside, even though her eyeglasses are cracked. Jeffrey intends to shoot the girls and then kill himself. As he removes Victoria’s glasses, he is whisked away screaming by a shadowy figure that we only see through Victoria’s blurred vision. The scene ends with the sisters, huddled together and hungry, watching a cherry roll toward them. Lucas looks forward to his new role. Annabel, not so much. Five years later struggling artist Lucas D’Asange continues to search for his brother and the girls, along with his girlfriend Annabel (Chastain), a performer in a rock band. A rescue party comes across the car, and then the cabin, where the girls, now eight and six, live in a feral state. An enormous mound of cherry pits puzzles the rescuers. Victoria and Lily are first put in a welfare clinic under the care of Dr. Gerald Dreyfuss, a shrink who just can’t wait to study them. In counseling, the more communicative Victoria talks about “Mama,” their protector during those five years. Both girls resist Lucas at first, but when he gives Victoria a new pair of glasses she is able to see clearly again, and she believes that Lucas is her long-lost dad. Lucas wants custody of the girls, but an antagonistic great-aunt, Jean Podolski, insists that she can give them a better home on the other side of the country. After all, Lucas and Annabel are practically broke. Dreyfuss, who wants to keep studying the girls, supports Lucas’s claim and offers him and Annabel a clinic-owned house where all four can live while Dreyfuss does his thing. Annabel is reluctant about this, but her love for Lucas wins out, and the four of them move into the big (spooky) place. Victoria quickly begins adjusting to her new life, but Lily continues her feral behavior. One night, Annabel sees a dark, spooky figure outside their bedroom door. Yep, Mama has accompanied the kids to their new digs. As she and Lucas investigate, Mama causes Lucas to fall down the stairs, and he winds up in a coma. Annabel is forced to take over the role as the girls’ guardian, and she’s not a happy camper. Mama is not too keen on being seen. Over time, Annabel warms up to the girls, especially Victoria. Lily mostly continues her feral ways, and while she remains close to Mama—Annabel hears them play but does not see Mama—Victoria is drawn more to Annabel. Not wanting Annabel to get hurt, Victoria warns her about Mama’s jealousy. When Annabel begins having strange, repetitive nightmares about a woman that seem related to what is currently going on, she asks Dr. Dreyfuss to do some more research. And that is when we learn about Edith Brennan—because she and Mama are one and the same. Edith Brennan lived in the nineteenth century. Possibly retarded, Edith had her baby taken from her and given to nuns when she was sent to an asylum. After escaping, Edith stabbed a nun, retrieved her baby and fled into the woods. When a posse caught up to her, Edith leaped off a cliff. She and her baby died when they struck a large tree branch. Edith fell into the river below, but the baby’s corpse became caught in the branch. (Dreyfuss retrieves the baby’s remains from a government warehouse.) Not knowing what became of her baby, Edith’s spirit continued to search the woods for well over a century, until finally, as Mama, she took on Victoria and Lily as substitutes. Annabel, Lily, and Victoria are attacked by Mama. Everything is about to hit the fan now. Lucas comes out of his coma when he sees a vision of his brother trying to tell him to go back to the cabin and rescue the girls. Dreyfuss does go to the cabin to confront Mama and is killed by her. Annabel steals the case files, including the box that contains the baby’s remains, from the shrink’s office and learns about the link between Edith Brennan and Mama. Great-Aunt Jean skulks around looking for evidence that Annabel has been abusing the girls so that she can get custody of them. A recent breakthrough by Annabel with Lily makes Mama even more jealous, causing her to attack Annabel and the girls. Mama kills Jean and inhabits her body in order to drive off with Victoria and Lily.